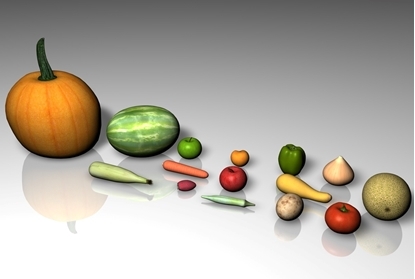 Fifteen 3D fruit and vegetable models in FBX 3D model format. Contains 59,926 polygons (total all models). Included 3D models: tomato, yellow squash, potato, okra, onion, bell pepper, peach, green apple, red apple, carrot, strawberry, corn, cantaloupe, water melon and pumpkin. The 3D food product models bundle contains 17 food container models for Poser and DAZ Studio. See below for full details of what is included in the bundle. A 3D baby food jar model in FBX 3D model format. Contains 2,052 polygons. A 3D set of beef patties (one grilled and one raw) models and a grill spatula model in FBX 3D model format. Contains 10,607 polygons (total all models). A 3D bacon lettuce and tomato sandwich food model in FBX format. Contains 44,609 polygons. 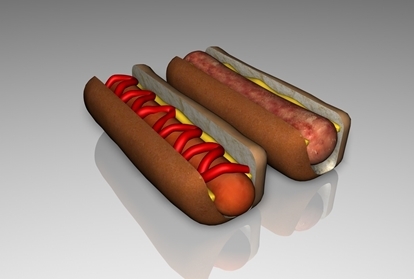 A 3D bratwurst and bun model and a hot dog and bun model in FBX 3D model format. Contains 20,371 (total both models). The 3D breakfast foods models bundles for Poser and DAZ Studio contains four individual food models sets. 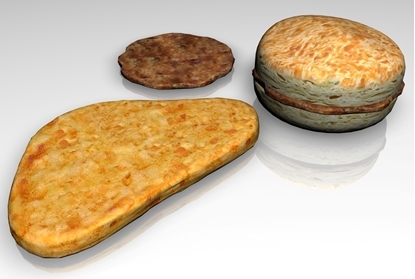 A 3D set of breakfast food models (Sausage biscuit, Sausage and a hash brown potato patty 3D models) in FBX 3D model format. Contains 4,160 polygons. A 3D set of breakfast foods (omelette, toast, tomatoes and bacon 3D models). Contains 22,542 polygons (total all models). A 3D buffalo wings meal food models set in FBX format. Contains 16,634 polygons. All models shown are included. The 3D candy bar and wrapper food models for Poser and DAZ Studio has two wrapper models. The closed wrapper contains no candy bar. The open candy bar wrapper has a candy bar in it that may be slid out (candy bar main) and is parented to the wrapper. The Candy bar bite piece is parented to the candy bar main model and may be hidden or moved as needed. A 3D candy bar and wrapper models in FBX 3D model format. The set includes a candy bar with a "bite" section and two wrappers, one is closed and the other is open. Contains 11,188 polygons (total all models).